(The Root) — "No, I'm not on any magical drugs. 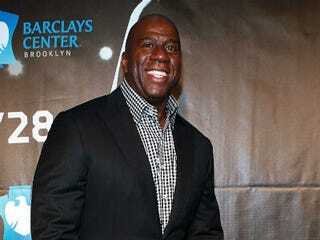 I've been saying that for 21 years," Magic Johnson told a small crowd of journalists and HIV- and AIDS-prevention workers over lunch at New York City's Gramercy Park Hotel on Wednesday. The NBA champion and star of the Los Angeles Lakers, after receiving the life-changing news that he was HIV-positive, announced his status to a gaggle of television cameras in 1991. Since then he has worked to change the way the world perceives people who carry the virus. But initially, Johnson had to seek someone to guide him through the process of dealing with his disease, both emotionally and physically. Now he is an international ambassador for HIV and AIDS prevention, the self-proclaimed "face of this disease," and he's endorsing the at-home HIV test called OraQuick. Produced by the pharmaceutical company OraSure, the test is the first FDA-approved rapid HIV test, which produces results in 20 minutes. It retails at pharmacies like CVS or Duane Reade, as well as online for about $39. OraQuick, which has been used by health care providers for just over a decade, uses a mouth swab to detect antibodies to HIV-1 and HIV-2 in oral fluid. And while this seems to be great news for people who would rather learn their status in their own bathroom, according to the Food and Drug Administration, the test does come with a caveat. "OraQuick would produce one false-negative result for every 13 true-positive tests," FDA staff told Bloomberg News, and it can also be administered incorrectly. For example, an inaccurate reading can result if a person takes the test too close to their moment of incidence rather than after three to six months, the approximate time HIV takes to appear in the human body. When asked about this problem, an OraSure publicist told The Root, "All of the directions are clearly marked on the product and on the website. There's a how-to video that explains that as well." Johnson added, "If people have any questions, even if they find out they're positive and want to take a second test at a clinic or a hospital, they should do so. I took the test twice when my first results came back. It's just that easy to ease your own mind; we just want people to get tested." Debra Fraser-Howze, former head of the National Black Leadership Commission on AIDS and current OraSure senior vice president of Government and External Affairs, added that her company made a point to reach out to the HIV/AIDS community to make their product as efficient as possible. The results are two pamphlets inserted inside the test's package, which include a hotline connecting users to local health care providers and therapists nationwide. Magic Johnson spoke with The Root about why he's endorsing this product and the biggest stumbling block blacks and Latinos face toward creating a generation free of the HIV/AIDS pandemic. The Root: You mentioned that a number of drug companies have tried to enlist your endorsement. Why choose OraQuick? Magic Johnson: It's a game changer for us in the HIV and AIDS community, especially when you think about the black and brown community. We don't want to go to the clinic. We don't want anybody to see us at the doctor. We don't want people to know if we're HIV-positive or not. A lot of the things that have troubled us about HIV and AIDS or we've had questions about, now we're saying, "You can have this test and you can do it in your own home, privately. If you want people to be there or not, that's up to you. You just need to know your status." It makes a difference, because I think more people will be willing to get tested, whether it is as a couple, with their girlfriends or with their boys. They'll know their results, and if they are HIV-positive, there's great information in [the OraQuick package] that can get them to a doctor, including a 1-800 hotline. If they have questions, someone will be able to answer them. TR: Receiving a positive test result could be traumatic. Does the hotline also provide access to therapists? MJ: Yes. You might want to call someone to ask something like, "What am I supposed to do now?" People will have a lot of different questions, just like I did when I found out. I had to search out someone who was living with the disease, Elizabeth Glaser, so she could help me. Now we're going to have somebody available on the hotline, and wherever the caller is, the hotline operator can send them to a doctor or health care provider so they can get on a regimen. The things that saved my life were early detection, I got on my meds and I accepted my new status 21 years ago. That's what people have to do today, along with exercise, a healthy diet and some sort of support system. TR: The HIV-prevention pill Truvada was released earlier this year to mixed reviews and some, like the AIDS Healthcare Foundation, would say negative reaction. What did OraSure do differently as a company to introduce their product to the HIV and AIDS community? MJ: HIV and AIDS groups helped build OraSure; it wasn't just a company doing it. Everybody came together and said, "This is what we're going to need." Everything you see in the OraQuick package, OraSure partnered with organizations to help create this, as well as the Centers for Disease Control. If a person gets a positive test result, all of the information he or she will need is in the pamphlets that come with the product. That's why I think it's different. TR: What's the biggest problem you see in the path toward defeating the HIV and AIDS epidemic? MJ: Testing. Now blacks and Latinos make up 50 percent of the new cases. A lot of us are walking around without knowing that we are positive because we won't get tested and keep infecting people. We've got to change our mindset, and I think that because of OraQuick, it will be easier for people to get tested together at home.